Cora vom Schwarzen Jäger passed the ZTP with 1A rating for character and V for conformation. Her sire, Gero von der Mooreiche, was twice runner-up at the D.V. Meisterschaft and also passed the Körung with highest rating for hardness and working drives. Her brother from a repeat breeding, Dago vom Schwarzen Jäger, was the winner of the D.V. Meisterschaft in 1997. Banjo: SchH 3 and passed the Körung 'for life' with Körklasse 2A rating. He is sire of the vom Burgwald “M” litter (Meike) and von der Horst “B” litter (Bandit, Bingo). Ben: IPO 3 and passed the Körung 'for life' with Körklasse 2A rating. 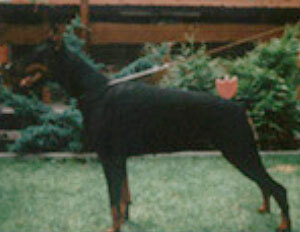 He is sire of the vom Ferrenberg “C” litter (Cleo) and vom Eschenbruch “I, M” litters (Ilk, Inou).